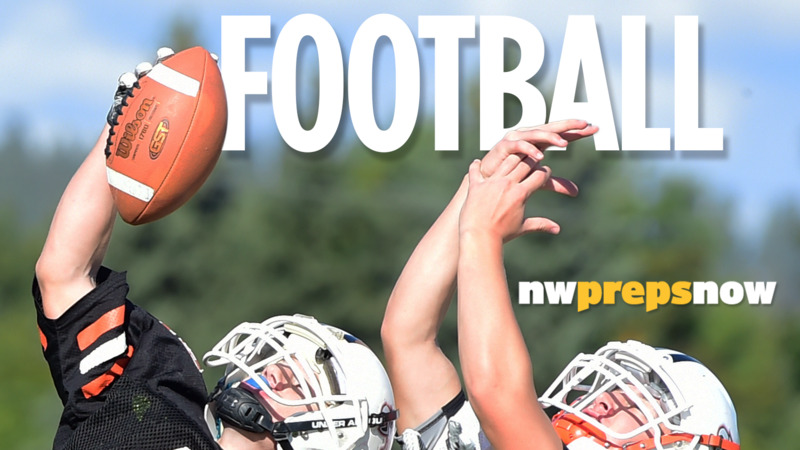 West Valley entered play on Friday ranked fifth in state 2A, with the Great Northern League title and the all-important home-field advantage for a crossover game to the state playoffs on the line. The Eagles got all they could handle from a game Cheney squad – and then some. It took a late field goal by do-everything quarterback Matt Allen and a goal-line stand on third and fourth downs with less than 30 seconds to play but the visiting Eagles held off the Blackhawks 17-14 in a game that fans of old-school football would have loved. The teams combined for nearly 500 rushing yards and just 53 through the air – all from Cheney. West Valley’s Marshall Meleney rushed for 105 yards with two touchdowns, while Allen finished with 65 yards on 16 carries. Eagles coach Craig Whitney said the way the game ended is what high school football is all about. “We talk about making a memory that will last a lifetime, and they’ll remember that,” he said. West Valley (7-1, 3-0) clinched the regular-season title. The Eagles have a rivalry matchup with 0-7 East Valley next week, while Pullman (6-2, 2-1) hosts the Blackhawks (6-2, 1-2) for the league’s second bid to the crossover games against the Central Washington Athletic Conference. “I didn’t even think about (the division title),” Whitney said. “We knew it was going to be a battle. WV’s Hunter Tiffany picked off a fourth-down pass in the end zone to thwart a late Cheney drive. Meleney busted one to the outside for 47 yards to the Cheney 32. On fourth-and-5 at the 16, Allen’s 33-yard field-goal attempt was true to put the Eagles up 17-14 with 3:14 left. “(Allen) does everything,” Whitney said. “We go through our special teams and I’m like, ‘He’s on a lot of stuff, we’ve got to try to get him a rest.’ So we rest him on defense, but he ended up playing a little defense there at the end, too. Cheney suffered a personal foul on the kickoff return and started at its 10. Quarterback Alex Long scrambled 19 yards up to the 43 and Mekhai Goodloe broke a tackle at the line and went 31 yards down to the 5. On third-and-goal from the 1 with 24.8 seconds left, Goodloe was stuffed. Cheney scrambled to get back to the line. With time running out on fourth down, West Valley stood firmly again to preserve the win. Goodloe gained 137 yards on 26 carries. Cheney got off to strong start, as Long found Luke Martin wide open for a 16-yard touchdown pass on its opening possession. The Eagles answered with an 11-play drive and Meleney’s 3-yard scoring run tied it up. On West Valley’s next possession, Allen was intercepted in the middle of the field by Goodloe to set the Blackhawks up at the 19. Four plays later, Long pounded it in from the 2 for a 14-7 halftime lead. The teams traded punts at the start of the third and West Valley took over at its 30 midway through. Meleney picked up 12 yards on a second-and-long, then finished the 11-play drive with a 16-yard rumble for a touchdown to tie it at 14 with 1:16 left in the quarter. Dustin Butkofer returned the ensuing kick to the West Valley 35, but the Blackhawks turned it over on downs at the 25. Cheney stripped Allen and recovered at the Eagles’ 29. But Goodloe’s pass to the end zone on fourth-and-7 from the 26 was picked off Tiffany. Published: Oct. 19, 2018, 10:56 p.m. Updated: Oct. 20, 2018, 12:46 a.m.